Want to hire a professional copywriter but not sure where to start? Here are three tips to make sure the partnership goes off without a hitch. Year-over-year growth in unique site traffic is 7.8x higher for content marketing leaders compared to followers. While you should be investing in content marketing, these 5 common mistakes can kill your ROI. Learn more here! Set yourself and your brand apart by creating a social media strategy. Here’s your four-step guide. If you're an SMB, you have a small marketing budget. Here's how to avoid wasting it on things you don't need. Tim Ferriss is a world-famous lifestyle guru. Here are a few world-class marketing tips to take from his years of experience. Building your small business can be challenging. Luckily, these ten tried-and-true tips can help. Wondering how to create a successful Adwords campaign? Here's what you need to know. Wondering how to create content that gets shared far and wide? Here's a simple and straightforward method. If you're not using a social media management tool you should be. Here's how implementing one can overhaul your marketing. Google Will now Punish Mobile Popups: What’s it Mean for Small Business SEO? Popups: they’re either astoundingly good, or amazingly bad. While some popups make us smile and convert, some send us diving for the back button, damaging small business SEO. At one point or another, we’ve all had the experience of leaving a website because the popups were simply too abundant, too intrusive, and too irrelevant. Luckily, Google recently decided to do something about this. The search engine giant announced on Tuesday of this week that it would start implementing a punishment for sites that use invasive pop-up advertisements on their mobile platforms. The question now is what does this big change look like for companies and consumers, and will it affect your site? The decision then goes on to say that Google will begin leveraging penalties against sites that feature intrusive pop-up advertisements beginning January 10, 2017. While this move seems harsh to some SEOs, it’s in line with Google’s recent focus on making the web a better place for mobile users, which began with the mobile-friendly label two years ago. Since then, the search engine has been on a mission to organize web content in a way that allows for increased functionality and a more positive user experience. In the last several years, mobile use has exploded around the world. In fact, Google reported last year that 2015 represented the first time in history that mobile search surpassed desktop search. Since then, the numbers have only gotten more astounding. When it comes to purchasing decisions, 48% of mobile users head to a search engine to start their research, and 4 out of every five consumers shop on their smartphones. As if that weren’t enough, more than 70% of mobile searches result in a sale within one hour. With those statistics in mind, it’s easy to see why 68% of companies have developed mobile marketing strategies to meet the increasing demands of mobile users. Unfortunately, however, many of those marketing strategies have included the use of pop-up ads. Pop-ups, while often obnoxious enough on a desktop, can be nearly inescapable on a mobile platform. As a result, Google has chosen to penalize these ads in favor of improving the overall mobile experience. While the changes are still a ways off, they will negatively impact marketers who don’t start adjusting their mobile strategies now. Which Ads Will Google Penalize? For examples of the ads Google intends to penalize, check out this screenshot, grabbed from Google’s announcement. As you can see from this visual, Google intends to punish any popup ad that makes it difficult for mobile users to access a page’s content. Are There Ads Google Won’t Punish? Yes! And many marketers are thankful to hear it. First of all, it’s wise to remember that Google uses upwards of 200 ranking signals, and this interstitial change is just one of them. That being said, however, mobile ad spending is projected to reach $100 billion by the end of this year, so it’s crucial that marketers begin the adjustment process now. The main thing that Google doesn’t want is ads that cover the body content of a page or make information difficult to access. With this in mind, pay careful attention to the way you place your ads. Make sure they don’t impair access to your page’s main content and ensure that mobile users don’t have to click out of them to access the critical points of your site. 84% of internet users between the ages of 25-34 report having left a site because of intrusive ads. Google knows this, and it’s one of the things that has factored into their recent ad changes. To avoid penalties for intrusive advertising, avoid displaying a large pop-up that users have to click through to access your site at all. While many marketers have attempted to make their advertising less intrusive by arranging it all above the fold, and organizing content below. Unfortunately, this misses the mark, and Google has made it clear that it will begin punishing these advertisements, as well. To avoid penalties for these types of interstitials, opt for banner ads, instead. In addition to being less intrusive, they’re also easier for your users to navigate around if they wish. Google has made dozens of changes to its mobile approach in the last several years, and it’s fair to assume that we’ll only see more as time goes on. While the changes are startling to many SEOs and small business owners, this doesn’t have to be the end of mobile advertising as we know it. 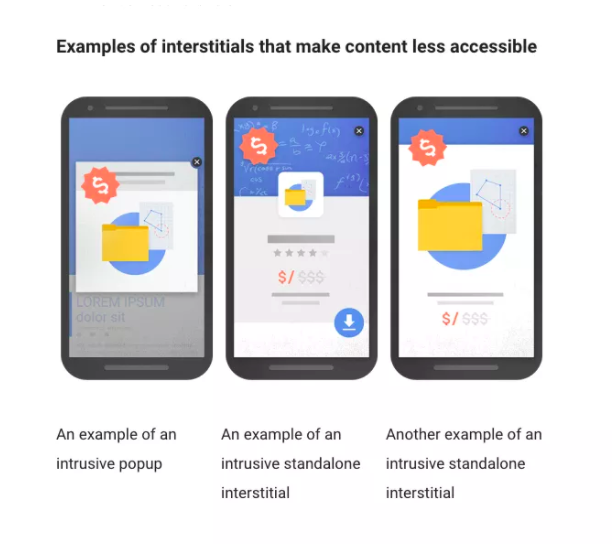 While Google is indeed altering the way it wants websites to approach mobile advertising, it isn’t putting a moratorium on mobile ads altogether. Instead, the search engine giant is simply furthering its mission to improve user experience by making content the primary attraction, and ensuring advertising is only a supporting player. By paying attention to Google’s most recent ad requirements, and being careful to ensure that advertisements add to rather than detract from a page, it’s easy for small business owners to avoid penalties unleashed by the Google Gods. Need help with your local SEO? Check out our SEO services to find the package that’s right for you! Local SEO is essential to help your small business get found online. Here's what you need to know about making it work for your business. Instagram can have a major impact on your brand's SEO. Here's what you need to know about using the platform to its full extent. Having a social media marketing strategy can make or break your SMM. Here's how to create one for your small business.